Gelsenkirchen - “I've always said I'd like to play in Germany again. It's got the best league in the world and that's where the best players belong.” 's in-a-nutshell summary of why he had unexpectedly swapped Serie A giants and seven-time European champions AC Milan for FC Schalke 04 at his official unveiling in Gelsenkirchen late last August was indicative of his progress on a personal journey altogether greater than the 700-odd kilometres as the crow flies between the Italian fashion metropolis and the Ruhr district city built on coal. Six years after taking his leave of the Bundesliga as an indisputably gifted but already polarising 20-year-old prospect, Boateng returned to it an established on-field leader and international-class box-to-box midfielder. Tasked with adding substance and authority to the engine room of a Royal Blues side whose early-season form had left much to be desired, he wasted little time getting down to work. The day after that introductory press conference at the Veltins Arena, with the ink barely dry on his four-year contract, the new No9 helped Schalke to their first league win of the season – 2-0 at home to Bayer 04 Leverkusen. “It was a bit of a surprise to get a start right away, but that just demonstrates the faith the coach and club are placing in me,” Boateng reflected after the match. “I just tried to do my best but there's plenty of room for improvement,” he said, playing down his own role in the outcome. As the campaign progresses, the improving effect he has had on the team as a whole is becoming ever more palpable. Heading down the final straight, Schalke are now delivering the goods with the consistency and resilience required to match the top-three finish of their aspirations, and Boateng has been fundamental to that renaissance. Born and raised in Berlin's multicultural, solidly working-class Wedding district, he joined the youth system of the capital's biggest club, Hertha, at the age of seven and worked his way up through the ranks to make his Bundesliga debut at 18. That was in August 2005 and over the course of the following two seasons Boateng became an increasingly familiar face to followers of the German game – unfortunately not always for the right reasons, however. Increasingly characterised in the media as a rebellious, wayward talent, the Germany Under-21 international was more than ready to move on when the English Premier League, in the form of Tottenham Hotspur FC, came calling in 2007. 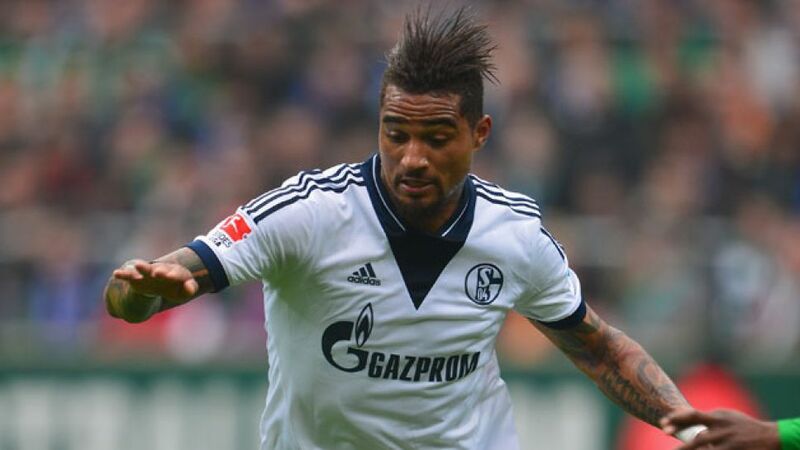 Looking back now on those early professional years, Boateng admits: “I did play up to that image. I was very young and it felt kind of cool to be the bad boy. But at the end of the day I learned that kind of thing just doesn't get you anywhere, especially somewhere like Germany.” After two less than stellar years on the books at Spurs, with the final half-season spent on loan at Jürgen Klopp's Borussia Dortmund, he joined Portsmouth FC and had an excellent campaign with the south coast outfit, culminating in a losing FA Cup final appearance against Chelsea. A missed penalty and a notorious foul on Michael Ballack which kept the Germany skipper out of the upcoming FIFA World Cup finals soured the occasion, but that self-same tournament in South Africa would prove the springboard that propelled Boateng onto the global stage. Having switched allegiance from Germany to his father's land of birth, Ghana, he was a key player for the Black Stars as they emerged as the top African team at the first-ever finals staged on the continent. Boateng's first senior international goal helped them to the 2-1 extra-time victory over the USA which secured a place in the quarter-finals, where they only lost out to Uruguay on penalties. That and his fine previous form for Portsmouth was enough to convince AC Milan, by way of a somewhat unorthodox arrangement with CFC Genoa, that the former 'bad boy' was more than good enough for them. And so it proved. Carving himself out a regular first-team slot in his first Serie A campaign, Boateng became an ever more influential component of the Milan midfield, moving in from the flank to take on the role of either deep-lying or advanced playmaker with increasing conviction and panache. The on-field aggression which had more than once got him into trouble in earlier years was now being ever more effectively channelled for the good of the team. In January 2013 he earned further kudos in Italy and far beyond by walking off the pitch in a friendly against fourth-flight Aurora Pro Patria in response to racist chanting from a section of the opposition support. The rest of the Milan team followed suit and the match was abandoned. Boateng's professional and personal maturation was not going unnoticed back in Germany, and Gelsenkirchen in particular. “We've been hard at work on this for weeks,” Schalke sporting director Horst Heldt revealed after the deal had been sealed. “It was easy to convince Kevin to join us, but not so easy to persuade Milan to let him go.” Boateng himself meanwhile admitted his main concern had been the reception he might get from his new club's diehard supporters, in light of that half-season on the books at their great rivals Dortmund.